Sunday night I finished the scarf. I’m really happy with how it turned out. After blocking, the scarf seems much bigger and softer. It is also very light, but should be nice and warm. The pattern is adapted from the Lizard Ridge pattern by Laura Aylor. You may remember it from Xavia’s blanket. The yarn is Regia Design Line Kaffe Fassett. It’s the same yarn I used for Amelia’s Baby Surprise Jacket, but in a different colorway. I am thinking that I’ll knit a bunch of scarves throughout the year and then at Christmas I’ll let everyone pick one. I’m not sure how I’ll do that. Have a “pick your scarf” party? Give everyone a coupon? Do one of those swap the gift games? I sometimes have a hard time trying to find the right yarn and pattern for gifts, especially for men. It’s much easier to knit something and let it find it’s owner. I recently read on someone’s blog (I forget whose) that the knitter will sometimes knit something with no particular person in mind and the first person to show an interest in it gets it! Isn’t that fun? 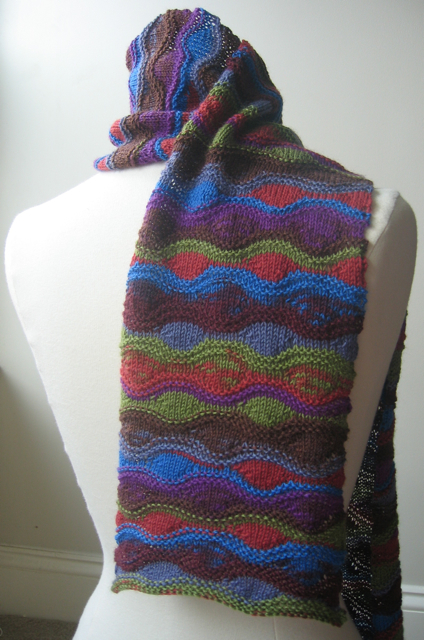 This entry was posted in Knitting and tagged Knitting, Laura Aylor, Lizard Ridge, Regia Design Line Kaffe Fassett, scarf. Bookmark the permalink. Wow, the scarf turned out lovely! I think your plan of letting gifts find their owner is a good one. Much more fun for you to knit what you like and less pressure. I say wrap each one and let people pick a gift. Then if they like someone else’s gift better they can swap!